2 Wahoo and 1 Barracuda in Aruba! Did you know that ‪‎Wahoo‬‘s are also known as “Mulato” in ‎Aruba‬‘s native language and ‪Barracuda‬‘s are called “Picuda” due to their snake like appearance? On this day we caught 2 Mulato’s and 1 Picuda (on the right)! Cedric Latham has been fishing locally and internationally for 25 years, participating in a variety of fishing tournaments and competitions. and will make sure you’re guided to the best fishing grounds around. Captain Cedric has experience in the surrounding sea of Aruba, Venezuela (La Guaira), Curacao & Bonaire. 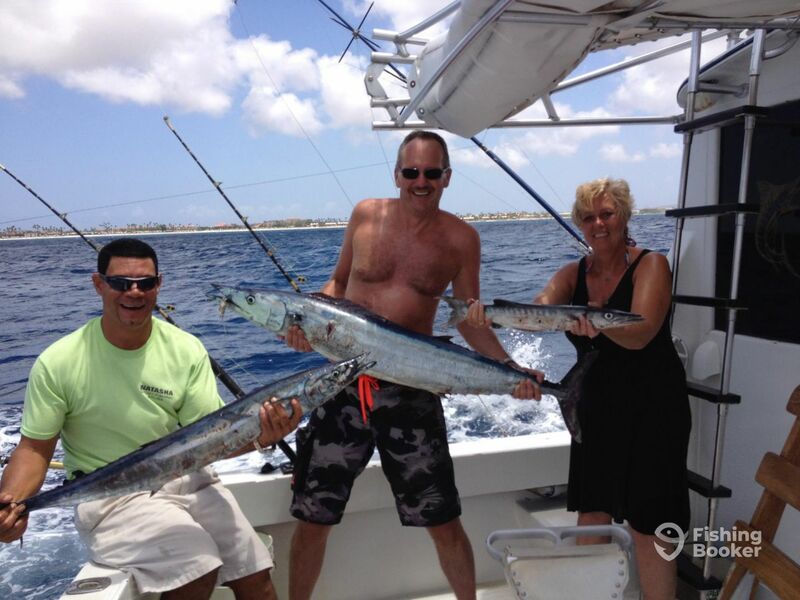 Let him and his crew take you out on the beautiful blue waters of the beautiful coasts of Aruba for a Fishing adventure you will never forget. Let our experienced Natasha Sport Fishing Team take you to a fishing adventure. Stop wishing and let's go Deep Sea Fishing.